Understanding psychological research by finding a problem, discovering the clues, and evaluating the evidence. 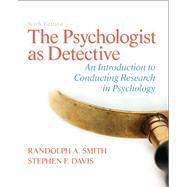 The Psychologist as Detectivesintroduces students to the research process. The authors treat psychological research as a detective case in which a problem is presented, clues are discovered, evidence is evaluated, and a report is prepared for consideration by peers. Found within MySearchLab, or as a stand-alone, Operation ARAis a new "smart game" that teaches critical thinking and research methods in the context of a "save the world" story-line. Learning Goals Upon completing this book, readers will be able to: Think critically about research and research methods Analyze research as a problem solving procedure Develop research skills by looking at examples of research studies Evaluate evidence from a research study and prepare a report or summary of the case Note:MySearchLab does not come automatically packaged with this text. To purchase MySearchLab, please visit:www.mysearchlab.comor you can purchase a ValuePack of the text + MySearchLab (at no additional cost): ValuePack ISBN-10: 0205861792/ ValuePack ISBN-13: 9780205861798. Randolph A. (Randy) Smith is Professor and Chair of Psychology at Lamar University. Randy completed his undergraduate degree at the University of Houston and PhD at Texas Tech University in experimental psychology (specialties in human learning/memory and statistics). Randy taught at Ouachita Baptist University in Arkansas for 26 years, chaired Kennesaw State University’s Psychology Department for four years, and became Chair of Lamar University’s Psychology Department in 2007. His professional work centers on the scholarship of teaching and learning. Randy served for 12 years as Editor of the Society for the Teaching of Psychology’s journal Teaching of Psychology and subsequently served as Editor of the Psi Chi Journal of Undergraduate Research. He has written several book chapters and articles and made numerous presentations dealing with varied aspects of teaching, applying social psychology to teaching, and assessment of teaching. He has worked with high school teachers grading AP exams since the test’s inception and has served as Faculty Advisor for TOPSS (Teachers of Psychology in Secondary Schools). He is a member of the American Psychological Association (a Fellow of Divisions 1 and 2—General Psychology and Teaching) and a Fellow of the Association for Psychological Science. In 2006, Randy received the American Psychological Foundation’s Charles L. Brewer Distinguished Teaching of Psychology Award and the University System of Georgia Regents’ Scholarship of Teaching and Learning Award. Stephen F. Davis is Roe R. Cross Distinguished Professor Emeritus of Psychology at Emporia State University in Emporia, Kansas. Currently he is Visiting Distinguished Professor of Psychology at Texas Wesleyan University and Distinguished Guest Professor at Morningside College. In 2002–2003 he was the Knapp Distinguished Professor of Arts and Sciences at the University of San Diego. He received his bachelor’s and master’s degrees in psychology from Southern Methodist University and his PhD in experimental psychology from Texas Christian University. In 2007 he was awarded the honorary Doctor of Humane Letters degree by Morningside College. His research, which always includes student assistants, has investigated such diverse topics as academic dishonesty, learning versus grade orientation of students, Type A personality, the Impostor Phenomenon, and the behavioral effects of ingesting toxic metals. He is the author of more than 300 journal articles, 31 books, and more than 900 convention presentations. Steve’s teaching abilities have drawn acclaim on the national level. He has received the National Distinguished Teaching of Psychology Award from the American Psychological Foundation and the Teaching Excellence Award from Division Two (Society for the Teaching of Psychology) of the American Psychological Association. His professional accomplishments also include serving as president of the Southwestern Psychological Association, the Southern Society for Philosophy and Psychology, and Division Two of the American Psychological Association. He also served as the National President of Psi Chi (The National Honor Society in Psychology). He has been elected as a Fellow of the American Psychological Association, the American Psychological Society, and the American Association of Applied and Preventive Psychology.